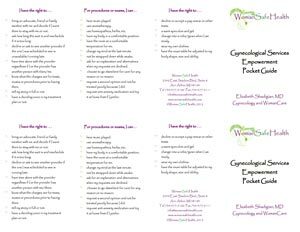 WomanSafeHealth offers gynecological services for all ages. If desired, women are encouraged and allowed to have a support person either in the room or on site, for any visits or procedures. WomanSafeHealth team members are also available to provide support. Depoprovera, Patch, Diaphragm, FemCap, etc. Menopause is unique to the individual and so are its symptoms. Sometimes women have few symptoms, because of their genetics, diet and exercise regimens, acupuncture treatments, or the other medications they may already be on. Elizabeth is a NAMS Certified Menopause Practitioner (NCMP). NAMS is the North American Menopause Society, which means that she has specific advanced training in the diagnosis and management of menopause and the physical and mental changes women may experience as they age. Additionally, WomanSafeHealth offers acupuncture and oriental medicine which eases many of the symptoms of menopause, as well as psychiatry and psychotherapy.